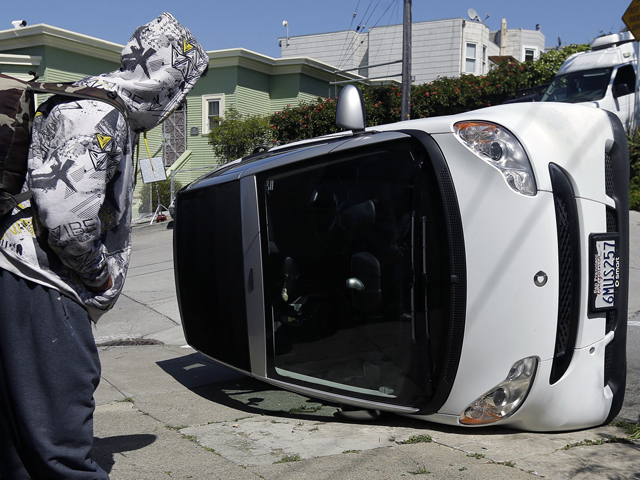 Smart cars, which weigh about 1,800 pounds, are the latest targets for a group of pranksters in San Francisco, giving rise to the “smart car tipping” trend. Photo by Jeff Chiu. No, not that kind of tipping point. While smart car usage is on the rise, it hasn’t quite crossed the Malcolm Gladwell threshold. We’re talking about a different trend: smart car tipping. It seems an unidentified group of six to eight “hooded vandals” have been roaming the streets of San Francisco and turning the lightweight, compact cars and turning them on their sides — to the chagrin of their owners. The moniker smart car tipping comes as the urban parallel to the practice of “cow tipping”, in which rural residents purportedly sneak up on unsuspecting cows and push them onto their sides. While cow tipping is, by most accounts, completely non-existent, smart car tipping is very real. Four cars were reported tipped in San Francisco on Monday April 7, leaving owners and witnesses, well, mostly confused. While this is not the first case of smart car tipping, even in San Francisco, it does perhaps have the most interesting social backdrop. As the city of San Francisco opens itself to the high tech industry, tensions are rising between longtime residents and incoming workers for Twitter, Google, eBay, and other major tech companies located in the Bay Area. Smart car tipping, as the theory goes, may be a form of rebellion against the city’s growing technocratic class. Is smart car tipping an extension of class warfare? In all likelihood, no. While it may be tempting to overanalyze the recent tippings in light of San Francisco’s shifting social context, no reports have confirmed the intentions of the perpetrators, nor has any pattern been identified among the recent tippings. In fact, it’s probably inaccurate to lump the rise in smart cars on the street in with the rise of the tech industry. Most large tech companies provide private bus or shuttle service — like the much-maligned Google Bus — to transport employees from the city to offices in nearby Silicon Valley. Regardless of the reasoning behind the recent outbreak of smart car tipping, it serves as yet one more reason to consider transit for your everyday commute. Good luck tipping over a 10,000 pound bus!